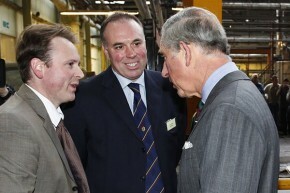 The Prince of Wales visited Bradford on 22nd November as part of his campaign to support the wool industry. 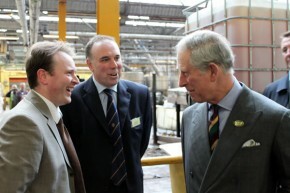 The Prince, who is patron of the Campaign for Wool, met with farmers and representatives from across the industry. The campaign involves groups from across the wool sector working together to improve public awareness of the benefits of the sustainable product. His Royal Highness (HRH) The Prince of Wales is well known as an environmentalist and has long recognised wool as the first choice fibre for sustainability, durability and quality. 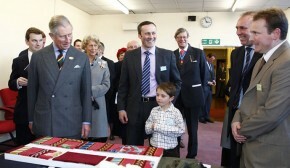 HRH has agreed to be the patron of The Campaign for Wool, an initiative based on his drive for universal sustainability. We are pleased to support the Campaign for Wool and celebrate the natural qualities of the fibre, we encourage you to do the same. 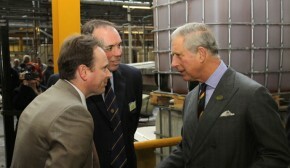 As part of his visit to Bradford, Prince Charles visited Bulmer & Lumb and took a tour around the mill. This incorporated a visit to Harrison Gardner where Prince Charles spoke to directors Jonathan Harrison and Daniel Harrison. He spoke to a number of people at the company and was delighted to hear that Jonathan and Daniel were the 4th generation of this family business. Harrison Gardner have dyed carpets for both Windsor Castle and Buckingham Palace and there was a display of some examples of this work. Prince Charles was very interested in this and it caused great amusement to the Prince when Daniel asked whether he would like any more!